Peach: It’s one year ago since your last time in Germany. There were three dates for Germany on your schedule this year too. Do you feel like at home? ZERO: I feel like at home, somehow. TSUKASA: I love it, when the atmosphere at concerts is raising and the beer tastes good! Peach: What connects you with Europe, especially with Germany? HIZUMI: Soccer, because it had the World Cup. Peach: The three concerts in Munich, Bochum and Berlin were sold out. How do you think about your German Fans who come so numerous to your concerts? KARYU: I love them all! ZERO: With every concert it’s getting more people who come to see us. I’m happy that they receive us warmly every time, even if we come from such a far away country. TSUKASA: I love you all so much. Thank you! Peach: This year your schedule was very tight in Germany. Did you have any time for sightseeing? HIZUMI: We couldn’t visit anything, but we explored the surroundings of our hotels. Karyu: There are some things I wanted to see, but for my part I filmed our trips and I’m satisfied with it. ZERO: It was the first time we were in Bochum. There we had a little bit more time. It was very calm and I felt really comfortable. TSUKASA: Not really, but we ate many delicious things. Peach: This time your world tour went through America, Europe and Japan too. What is the biggest difference, when you’re playing in so many countries? HIZUMI: Depending in which country we are the atmosphere is different. Karyu: The temperature. During the lives the atmosphere was hot from the love of our fans. Peach: For your concerts in Europe you had a song voting. At your concerts, i.e. in Munich, you played very old songs like “Marry Of The Blood” and newer ones like “DEVIL’S PARADE”, “LOVE IS DEAD” or “abyss” a colored mixture. What was the idea behind it? Karyu: The songs that they wanted to hear the most were different but we chose a few of them who fit our actual concept. It was fun to play older songs again. ZERO: We played older songs of it we wanted to play. It makes no difference for me, if it’s older or newer songs of D’espairsRay. They are a part of ourselves. Peach: How is it for you to create such a mixed playlist? Does it make your concert more difficult or varied? Karyu: It was that, what we wanted to do. I for myself liked it. (laughs) And otherwise I’m happy to see that our fans had fun. There were so many votings. ZERO: It was definitely more varied. The atmosphere on the concerts was really great! Peach: What was the craziest that happened on this year’s tour? HIZUMI: That the first time in my life I drove with a night train through Russia. ZERO: I’m totally in a Soccer fever now, that’s why I visited a sport shop in every country. Peach: You celebrated your 11th anniversary this year. Do you think D’espairsRay changed since your establishment? Karyu: We grow up to a band who is loved by different people from different countries. Peach: At your birthday gigs you like to change parts. TSUKASA sings, HIZUMI plays bass, ZERO plays guitar and Karyu tries to play the drums. How were the rehearsals for it? ZERO: I didn’t need to practice so much, because I’m playing a stringed instrument and I have an adavantage. TSUKASA: We started practice after the rehearsals one week before [the live]. It went well, right? Peach: What do you think when you see and hear the other in “your” position? Karyu: I think it’s fun for everyone. ZERO: For me it’s refreshing. TSUKASA: I felt like I was at high-school. Peach: D’espairsRay has a long discography yet, but just 4 albums. What do you think when you listen to your first full album “Coll:Set” now? 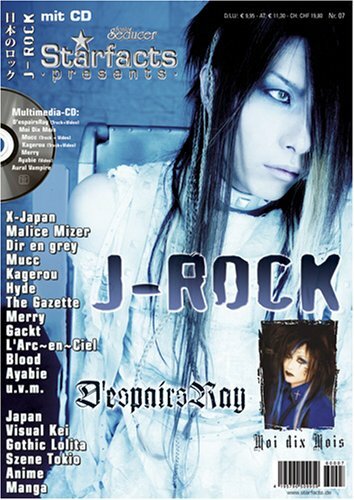 HIZUMI: It is the album that shows like the core of D’espairsRay. Peach: What comes spontaneously into your mind to “MIRROR”? Peach: To what extent is “REDEEMER” still a part of D’espairsRay? HIZUMI: How can I describe it: It is our imagination of exemption. Peach: “IMMORTAL” is a Best-Of album that was released in Germany lately. How do you came to this track list? HIZUMI: Here are the songs, that went well on our concerts. Peach: “MONSTERS” is your so called youngest baby. What do you think about this album? HIZUMI: This album is something like a summary of our past ten years. It is how D’espairsRay are nowadays. 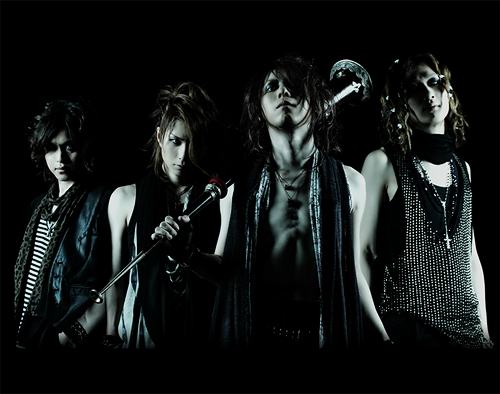 Karyu: “MONSTERS” hides the soul of how D’espairsRay is now. ZERO: Musically we went forward, but in this album we wanted to get back to our roots emotionally. Peach: This album has got not only just really good, every song is unique. The styles of the songs vary much and the rhythms are so different as day and night, too. How do the preparations and recording went for “MONSTERS”? Karyu: Oh yes, it was very exhausting, because we did so much by ourselves. TSUKASA: We have always intensive preparations. This time we wanted to consider the wishes of every respective songwriter, too. There we had thought so much about us, our style and about the music, so that every of our songs has the best result it can have. We are really satisfied with it. It was laborious in some parts, but all in all we had fun. The next album has to be better than this. You always have to get a better self and we want too. Peach: With which of your songs do you connect yourself the most and why? HIZUMI: “DEVIL’S PARADE”. Because it’s something like D’espairsRay and then just different. Peach: How do you see yourself the musical development from “Coll:Set” to “MONSTERS”? Karyu: In comparions to our earlier days our music has been grown further. We grew up likely, I think. ZERO: Looking back I think that it is a natural growing up, right? Peach: HIZUMI, already on your last album “Lost in re:birth” was completely in English. This time you wrote the lyrics of “DEATH POINT” completely in English. Why? Isn’t it easier to express in your own language? HIZUMI: It is easier to write Japanese for me, but I also wanted to express the Japanese way in English. Peach: Karyu, if to follow your biography, then it was you who brought the band together. Do you remember your first impression as you played your first concert together? Peach: TSUKASA, you’ve been called the “party boy” . [in original it’s someone, who lifts up your mood, but I thought this would match more XD;;] How is it for you to tour with the others over such a long time? Do you argue often? Peach: ZERO, for many fans you are a mystery, because you rarely say something on stage. But on the internet you are the most active of you guys. Why are you blogging and twittering so much? And what do you think about fans who follows your words? ZERO: Yes, I say nothing or less. That’s why my character is a little bit misjudged, but for me it’s kind of amusing. (laughs) At blogs and so on I am more open as I am. I’m having fun. Peach: One message has really shocked all of your fans: You are going on hiatus after the tour. Many are sad about it, but the more wish you, HIZUMI, that you will recover and get healthy soon. HIZUMI: Thank you for all your best wishes! Karyu: At first we want of course, that HIZUMI is healthy and until our comeback we want to try various things. Let’s see, what comes out. But we will come back for sure. Peach: Does your fans could hope for the one or another release? Karyu: We haven’t planned anything yet. But at the end of March a DVD from the “Human-clad Monsters”-Tour will be released. Peach: We hope of course, that you fully recover soon. What is next on your to-do list? Karyu: Now we hope that D’espairsRay stays in your heart due to the last tour. Afterwards we like to give you new memories of us. TSUKASA: I want to go on with D’espairsRay. All what we will create together will be good. Peach: Please tell us some personal things: When did you really laugh the last time? HIZUMI: When I watched the DVD “Suberanai Hanashi”. Peach: Are there musicians you still see as idols? HIZUMI: Takanori Nishikawa, Sakurai from BUCK-TICK and Arashi Moritomo from T-BOLAN. ZERO: I respect all musicians. Peach: To what are you looking forward when you come home after a tour? HIZUMI: To time for myself alone. Karyu: Japanese cuisine and parties. Peach: What’s your favorite quote? Peach: What means D’espairsRay to you? HIZUMI: It is like the top of the pyramid. Karyu: It is my one and only. Peach: What would you like to try out on tour? HIZUMI: An Open Air concert would be great. Karyu: Yes, definitely having a concert under the open sky one time. TSUKASA: A world tour through all continents. Peach: Do you have a message for your German fans? HIZUMI: This time it was a really great tour. Thank you and see you next time! ZERO: When this tour ends, we will have a break at first, but we are looking forward to see you again soon! TSUKASA: Thank you that you always support us. I don’t know when we will come back to Germany, but as long as we have fans here who wait for us we surely come back. Until that listen to our music if you miss D’espairsRay. Note: This translation is a real mess. I can't improve my Englisch, so if someone has a better translation/ideas for words or whole parts, feel free to write them down in the comments!